A California restaurant has settled a federal discrimination lawsuit filed by a black customer who received receipts using an offensive racial slur. The settlement is the latest bit of cultural controversy to hit the restaurant industry in recent months. 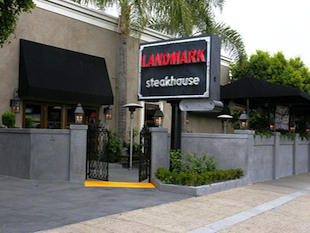 The Orange County Weekly reports that Mark McHenry had been a regular at the Landmark Steakhouse in Corona del Mar for several years. McHenry says employees at the restaurant had made uncomfortable comments to him previously, such as, "black is the new white," but that he nonetheless continued to patronize the establishment. However, on Dec. 5, 2010, McHenry visited Landmark twice in the same day. He received three receipts, all containing racist language. Written on the receipts were the derogatory names, "McStinkyN*gger," "McNigS*it," and "McCottonwood." You can view one of the offending receipts here. In one voicemail, the bartender said: "Yo Mark. Hey it's [NAME WITHHELD]. Give me a call when you get a chance man. Just wanted to apologize for that tab, dude. You know we were totally jokin' around." In a follow-up text message, the bartender said: "I know I made a big mistake by crossing the line. I have a family & mortgage that depend on me." In another text message on Christmas Eve, he said: "merry christmas! hope to see you soon. we miss you! please forgive us for being stupid. its not the same without you there. luv u bud!" McHenry's attorney Stuars Shanus told msnbc.com he and his client are not disclosing terms of the settlement and Landmark Steakhouse has declined requests for comment as well. However, court documents show the bartender who sent the messages to McHenry was fired a week after the lawsuit was filed last March. The incident is the most recent in a string of racial incidents in the food industry over the past few months. In January, Papa John's Pizza apologized after an employee gave a receipt to an Asian customer which read, "lady chinky eyes." A month before that, Chick-fil-A, better known for filing its own lawsuits, fired a cashier who put the racial insults "Ching" and "Chong" on the receipts of two Asian customers at one of its California restaurants. And also in January, McDonald's suffered a PR headache when someone put photos of discriminatory signs online, falsely asserting that they were posted in an actual McDonald's restaurant.